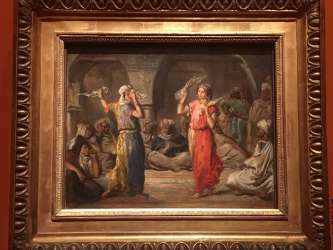 In Paris, the Marmottan-Monet Museum is presenting, from March 7 to July 21, 2019, the exhibition “L’Orient des peintres, du rêve à la lumière”. With some sixty masterpieces from the most important public and private collections in Europe and the United States (Louvre Museum, Musée d’Orsay, Musée des Augustins in Toulouse, Städtische Galerie im Lenbachhaus in Munich, the Thyssen-Bornemisza collection in Madrid, the Rijksmuseum in Amsterdam, the Sterling and Francine Clark Art Institute in Williamstown), the exhibition aims to reveal through this journey to the Orient the painters view on this fantasy world. Indeed, carried by the impetuous breath of Napoleonic conquests, European painters have fantasized the East, sometimes even before having experiencied it througt travel. 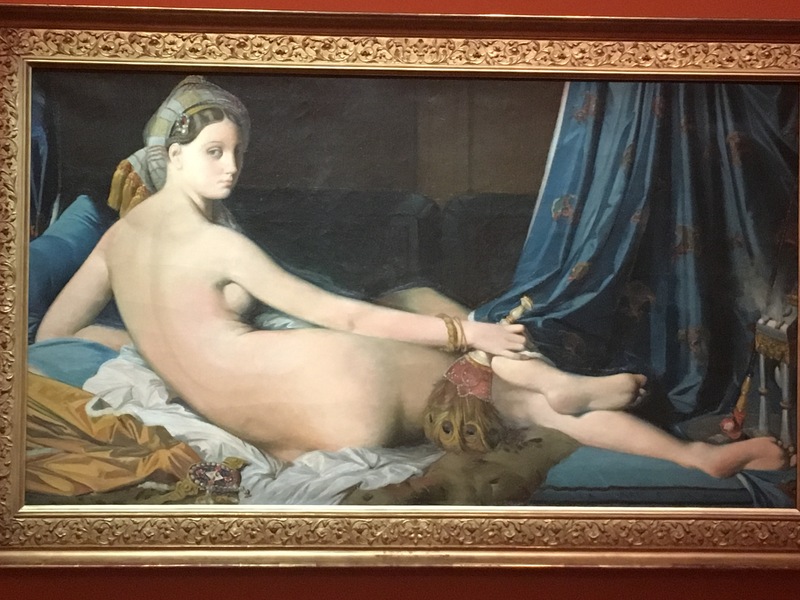 What we notice when we visit the exhibition is that travel in the East is inextricably linked to the sensuality of the female figure, represented by Ingres and Delacroix in the early days of modern art, but also to the experience of a unique landscape and a light that shocks the eyes and takes us to another world, far from Paris. The exhibition presented at the Musée Marmottan-Monet shows its visitors two themes: figures and landscapes. 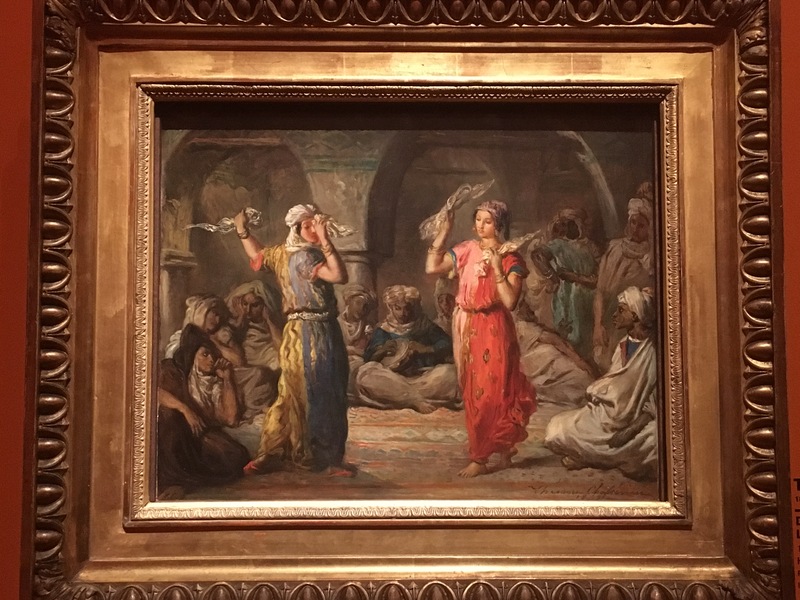 The exhibition takes us on a journey through the Mediterranean East, allowing us to admire representations of an oriental feminine beauty in all its sensuality, but also to immerse ourselves totally in an intimate atmosphere reminiscent of the oriental courts, thanks to the play of light and colour. The paintings reveal themselves to us as windows opening onto an arid desert, a lush jungle or a fountain of fresh water in an Ottoman setting of blue mosaics. Some paintings such as La Petite Baigneuse or La Grande Odalisque by Ingres testify to the painter’s bewitchment by the classic orientalist beauty and embody a dream of ideal female beauty fantasized for its sensuality and the eroticism of a body imbued with fantasies. In the same way, the places appear nestled with an aura of dream and desire, notably the representation of Jules Migonnay’s Bain Maure or the Édouard Debat-Ponsan’s Massage,scène de hammam, whose contrast of the black and white bodies earned him his scandalous fame during his exhibition in 1865. 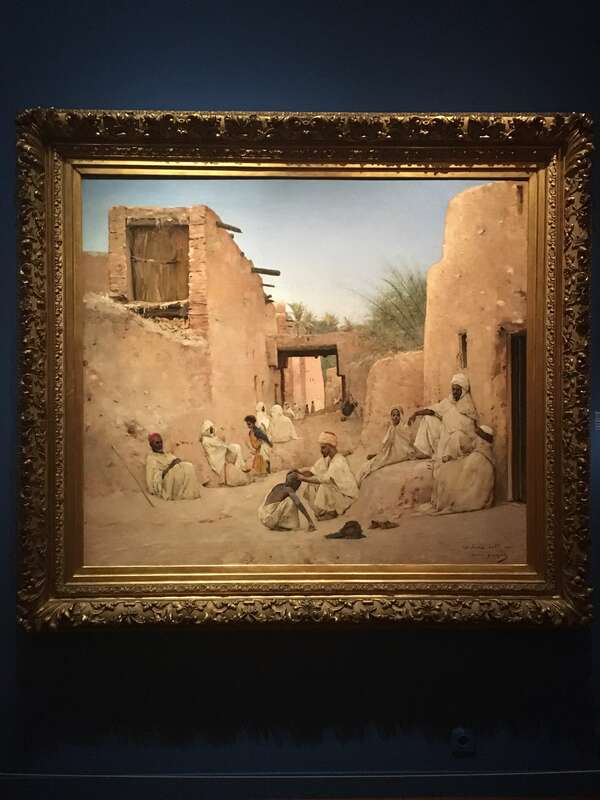 However, other painters tend to distance themselves from the representation of an idealized Orient and try to give us a reality, less dreamed, less fantasized but very real: that of the desert, of aridity, of stifling heat, of thirst and sometimes even of death. 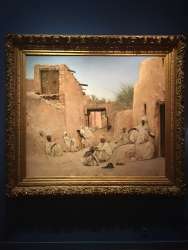 Eugène Fromentin in his painting of La Rue de Bab-el-Gharbi à Laghouat presents a painting divided in two, shadow and light, death and life. In the dark part, he depicts bodies lying on the ground, probably seeking refuge in the limited freshness of the street shadow. If you would like us to organise a private visit to an exhibition or museum in Paris… contact us here.